MFO is at the forefront of embedded consumer financial education. It is actively piloting and monitoring a variety of financial education content and channels that are both responsive to consumer needs and integrated into the ‘core business’ of the FSP, telco or other organization, rather than being peripheral. By ‘embedding’ MFO means the process of identifying all existing and potential consumer contact points and ‘teachable moments’ within the existing operations of a FSP, telco or other organization, for the express purpose of building a full coverage financial education delivery system. 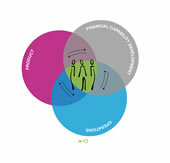 In other words, an organization that ‘embeds’ financial education, demonstrates effective use of every meeting point or point of contact with consumers to deliver or reinforce key financial management messages that consumers need to make and exercise money management decisions that best fit the circumstances of their lives. Instead of creating additional spaces or costly once-off services to provide consumer financial education training; embedded consumer financial education intentionally seeks to identify ways to intercept consumers during their existing interactions with the organization, effectively leverage staff to make financial management messages and consumer financial education training accessible and cost effective and in line with overall organizational objectives.